Home Information Are You Leaving a Digital Will ? Are You Leaving a Digital Will ? Most of us have lots of downloads and information stored online, but what would happen to it if you died? Lets looks at how important it is to leave a digital will. It's hard enough to think about what should happen to our money and property after we die, but increasingly, with so much of our personal life stored online, we also have to consider how we dispose of our digital possessions. We may want to pass on photos, software, music and movies to loved ones, but how easy will this be? And what happens to our digital possessions if we fail to properly organize an inheritance? A recent study by hosting and cloud-computing company Rackspace (www.rackspace.co.uk) found that nearly a third of British people would like to leave a 'digital inheritance' for their friends and family, while just over half of us consider the photos we store online to be 'treasured possessions'. Almost 70 per cent said that the laptop containing their digital memories would be the first thing they'd rescue if their house was on fire. All this would suggest that we're taking our digital inheritance very seriously. So why does the same study find that only 11 per cent have included, or plan to include, their online passwords in their will? Clearly, many of us haven't yet got round to addressing this tricky issue. Security for online data has deliberately become more complicated in order to thwart hackers. Some accounts need numerous passwords, codes sent to mobiles and physical keycards to access them. But if you leave the correct legal procedures in place, your family and friends should also be able to access your accounts. You could, of course, simply write down all your passwords and give it to your next of kin, but this poses a security risk. One way to safely pass on your details is to include in your will details of which relative or friend should have access to which account. Each password is kept in a sealed envelope with the solicitor, but separate from the will itself. After the details of the will are sorted, each envelope can be passed to the relevant heir so they only get the login details they need. 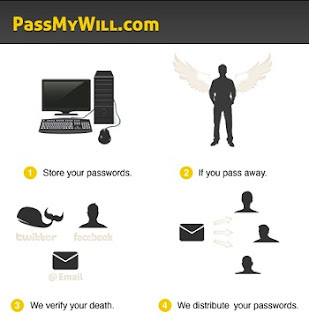 Another way is to use a service such as PassMyWill.com (http://passmywill.com). This connects all your accounts to each other and, after you die, confirms your death from official records. Logins to your accounts are then emailed to the people you've specified. If you don't leave your passwords for your family and friends to use after you die, it won't be easy for anyone to access your account. Most webmail services and social networks refuse to automatically hand over password and usernames to next of kin, but they do have specific policies on how posthumous accounts are managed. Facebook, for example, lets family members shut down or 'memorialize' profiles. It will remove sensitive information, including contact details and status updates, but the account wall will be left open so people can post messages. Facebook then gives relatives five days to download any updates or photos that were shared publicly before removing them completely. It never hands over login details. Google demands a court order before disclosing account login information for any of its accounts, including Google owned services such as You Tube and Picasa. Naming someone as the recipient of a password in your will is not enough to make Google hand over the data. Microsoft will shut down a deceased person's account on any of its services, including Hotmail, Windows Live and Xbox Live, if contacted by the person's family. However, it will not hand over details without written proof of the person's death and the next of kin's power of attorney. Such conditions may seem unnecessarily restrictive, but they're flexible compared with Yahoo's policy, which is to completely deny access to all accounts, including Flickr. These differing policies have led to calls for a standard procedure across all websites for dealing with personal accounts after death. The Law Society's wills and equity committee chairman Richard Roberts said: "website providers need to have a code of conduct that says if they are approached by a family member, as long as they're satisfied that this person is dead and the person is speaking with authority, they'll take the page down". Leaving your passwords isn't just crucial for allowing family and friends to access your valuable downloads and data. It's also important if you want to prevent posts to your Facebook wall by, for example, applications that automatically send daily jokes or links. If you grant access, your friends could continue to receive updates which appear to come from you after you die. Less legitimate but just as distressing, if your email address or passwords are stolen by hackers, your account could send emails on your behalf to your contacts after you've died. To tackle this problem, the European Union is currently discussing the 'right to be forgotten online', which would give people the right to force social networks and companies to completely erase personal data while they're still alive. You would also be able to force search engines to remove mentions of you in search results. Crucially, your family would be able to delete all information about you after you die, unless you had stipulated otherwise. One of the reasons why the issue of a digital will has become so pressing is that large sums of money are involved. Almost a quarter of people questioned in the Rackspace study valued their music and movie downloads at around £20 0. Estimates put the total value of downloads owned by the British public at £2.3bn. This has led to law firms asking clients for details of their digital inheritance as a matter of course when putting together a will. Sian Thompson, head of wills and probate at Simpson Millar LLP, told Web User. "A person's possessions in the digital age are more than simply solid and tangible, like property and furniture. There's a strong argument for formally including, as part of an estate within a will, important details that relate to online activity, such as passwords, usernames and profiles". As law firms take digital legacies more seriously, we'll find it easier to face up to arrangements we have to make for after we die. The sheer value of the assets we're storing in the cloud should make us think about what kind of digital legacy we want to leave so we can be sure our online life is preserved after we finally log off for the last time.